Nami Island is a must visit for lovers and fans of Korean Drama "Winter Sonata". This romantic island is located more than 60km from Myeongdong. You can get there either by train or bus. The journey from Myeongdong Station to Gapyeong Station where Nami Island is located will take about 1 hour 30 minutes. As you need to change train line 3 times for this trip, it is not advisable to sleep or take a nap during this trip or you may miss the stations to change line. From Myeong-dong Station, take LINE 4 train heading to the direction of Chungmuro Station to get to Dongdaemun History & Culture Park Station. When arriving at Dongdaemun History & Culture Park Station, change to LINE 2 and take the train heading towards Sindang Station to get to Wangsimni Station. When arriving at Wangsimni Station, change to JUNGANG LINE and take the train heading towards Cheong-nyangni to get to Mangu Station. When arriving at Mangu Station, change to KYEONGCHUN LINE and take the train heading towards Galmae Station to get to Gapyeong Station, which is our destination. Train Route from Myeong-dong Station to Gapyeong Station (Nami Island). This train journey from Myeongdong to Gapyeong will cost you KRW 2250 (T-Money Card) or KRW2350 (Cash) one way. Taxi - Once you are at Gapyeong Station, you need to take a short taxi trip (costs about KRW2500-3000) to get to the ferry wharf to Nami Island. Walk - You could also walk but it will take you 20-30 minutes and the direction to the ferry wharf is not straight forward. Once arriving at the ferry wharf, proceed to the ticket booth to buy your "Entry Visa" to Nami Island which costs KRW8,000, which includes ferry to and from Nami Island and, of course, entry to Nami Island. First of all, the bus to Nami Island does not depart from Myeong-dong. The bus depart from Insadong but fortunately Insadong is just a short subway ride from Myeongdong. Please take note that there is only one shuttle bus a day at 8.30am. Make sure you make advance booking online AS EARLY AS POSSIBLE to secure your seat because ONLY ONE BUS PER DAY. (Note: Choose Shinsegae Duty Free in Myeongdong as your "pick-up location" when booking. Other available pick-up locations are Insadong and Namdaemun). The two-way ticket for shuttle bus to Nami Island costs KRW25,000. This is not expensive given that it also includes the KRW8000 "Entry Visa" and round trip ferry tickets to Nami Island. So, with that said, here is the pick-up bus stop location to go from Myeongdong to Nami Island by shuttle bus (CLICK TO ENLARGE MAP). Pick-up Bus Stop Location for Shuttle Bus from Myeongdong to Nami Island. As you can see from the map, the bus stop for Shuttle Bus from Myeongdong to Nami Island is located right in front of the famous Shinsegae Duty Free in Myeongdong. It is strategically located within walking distance from both Myeongdong Station and Hoehyeon Station (subway stations). From here, the shuttle bus will take you directly to the ferry wharf of Nami Island to cross the river to Nami Island. NOTE THAT the return bus will leave Nami Island ferry wharf at 5:00pm in the afternoon to head back to Myeongdong (to same location- Shinsegae Duty Free). To be safe, you are advised to take the ferry from Nami Island whalf to the bus parking bay AT LEAST half an hour before the return bus departure time to Myeongdong. You will be back to Myeongdong at around 6.30pm or 7.00pm if there is heavy traffic on that day. TIP 1: If you want to squeeze Nami Island, Petite France, The Garden of Morning Calm and Gapyeong Rail Bike all in one day, the most effecient way is to join a shuttle bus day tour from EXIT 2 Myeongdong Station (KRW100,000 - all 4 admission tickets included). TIP 2: Winter ski season normally start from December to February. If you want to go to Vivaldi Park for ski after visiting Nami Island, BOOK THIS BUS instead. Yes, the journey from Myeongdong to Nami Island is not straight forward, especially if you are taking train, but it is definitely worth it once you are there at the beautiful and romantic Nami Island. You may feel a bit exhausted by the end of the day but you will certainly return to Myeongdong with sweet memories from Nami Island. may i know how much it cost you from myeongdong to seoul station and seoul to jonggak? Metro from Myeongdong Station to Seoul Station will cost 1750 Won if you use transit card such as T-Money card or 1850 Won if you use ticket. Metro from Seoul Station to Jonggak Station only costs 1050 Won if you use T-Money card or 1150 Won if you use ticket. There are definitely enough activities to do on Nami Island to stay until 4pm. However, if you dislike outdoor activities, you may consider leaving earlier any time by taking the train back to Myeongdong. If we take trains, can we still use T-Money after transferring in Wangsimni Station before changing lines for kyeonkhun Line for Gapyeong station before getting to ferry.??? Yes, shuttle bus is a better and easier option if you dislike the hassle of changing train lines. Just call +82-2-753-1247 to reserve your seat a few days before hand. For shuttle bus, you have to pay cash for the ticket. T-Money card cannot be used for the shuttle bus from Seoul to Nami Island. Nami Island is opened 7 day a week. You can plan your visit on any day that suits your schedule. Going on weekdays is a good idea since some places of interest in Seoul (such as palaces, museums) have a rest day on one of the weekdays. Ah, I will make a call for reserving our seats for the 3 of us before or when we are arriving in Korea in March 2015. Now I know I have to pay cash for the tickets (but return trip tickets because it's better for us to get it)... Also, after visiting Nami Island and leaving from Nami, on our Return trip tickets for our seating numbers, does our seat numbers from Nami going back to Seoul will be the same seat numbers? Because this is the first time I haven't been to Nami. Yes, weekdays is better but I will still have to make a schedule if I decide to go to Nami after Jeju Island. I will be in Korea for 10 or 11 days. Why the charges of using subway from Myeongdong station to Nami Island (KRW2,050) is cheaper compare to shuttle bus - KRW15,000 (exclude the entry visa fee)? The time of journey is more or less the same right? The charges for subway / train trip from Myeongdong, Seoul to Gapyeong Station before going to Nami Island is cheaper but less convenient because you need to change train lines three times, whereas the shuttle bus take you from Seoul directly to Nami Island ferry wharf without hassle. Can we take the shuttle bus one-way, just going to Nami? Because we want to leave the island earlier than 4pm. Will just take the train on the way back. Thanks! Your posts are really helpful! Is it possible to go to Petite France (Little Prince) after we visit Nami Island? If yes, how to go there from Nami? Any advice, please? Thank you. Yes, it is possible. That's actually what most people do if they don't want to spend a long time at Nami Island. So, I don't have to buy the two ways ticket? Just buy the one way tix to go to nami island? Hi, the travel time from Myeongdong Station to Jonggak is only about 15 minutes. If you want to be safe, you can consider adding 30 minutes to the trip. Hi, do you accept email reservations for the shuttle bus booking? I plan to visit Nami Island + Petite France, is there enough time if I were to book your returned shuttle bus? What time does the shuttle bus leave from Jonggak Station to Nami on 25-27 Oct? How much is the train ticket from Myeongdong to Jonggak Station? We do not operate the shuttle bus. You can contact the Shuttle Bus company at phone number +82-2-753-1247 to make reservation. Bus to Nami Island departs at 9.30am daily. The subway train ticket from Myeongdong Station to Jonggak Station is 1150 Won (ticket) or 1050 (Transit Card). If you are going to Nami Island + Petite France, you may want to consider going with shuttle bus but coming back with train so that you have enough time to visit Petite France. There is a regular bus service from Nami Island to Petite France. See my comment above to Cherry. How many days in advance do I need to book the shuttle bus to Nami Island? From Petite France, how do I go back to Myeongdong? If I'm taking train back to Myeongdong, do I need to buy different types of tickets for the changing? You can book the shuttle bus to Nami before the day of travel (but as early as you can). From Petite France, you can take the "Gapyeong Tour Bus" back to Gapyeong Station (Train Station). The bus leaves Petite France at 10:50am, 11.50am, 12.50pm, 1.50pm, 2.50pm, 3.50pm, 4.50pm and 5.50pm. Get off the bus at Gapyeong Station (one station after Nami Island Station). From Gapyeong Station, you can buy your return train ticket from the ticket machine / counter at Gapyeong Station to go back to Mangu Station. From Mangu Station onwards, you should be able to use your T-money card again. There are coin operated lockers for rent at the Ferry Wharf (near ticket counter / Men Toilet). I am not sure if there is locker for rent at Gapyeong Station or Gapyeong Bus Terminal. If there isn't, I am afraid you have to store your baggage at Nami Island Ferry Wharf. 1.Besides subway train from myeongdong to Gapyeong station I read there are a train called ITX can we get. from Yongsan or Chongyangni station...what is diferences ITX with Subway that you mention above...are ITX more convenience ,more faster ? Could we pay ITX with T Money ? If not how we can buy ITX Ticket ? Can we directly buy on the station ? 1. It is actually the same. KYEONGCHUN LINE which is the last segment of train line suggested above is actually served by ITX train, not subway. To my knowledge, you cannot use T-Money on this line and have to buy separate ticket directly at the station you board the ITX train. 2. Both options are possible. If you want to go Nami Island first, then you need to leave Seoul in the early morning to have enough time to get to Sockho before dark. The way from Nami Island to Sockho is as below. 1.Can CHUNCHEON bus terminal reachable from Chuncheon subway station ? If yes, what in more comfortable and easier to reach Chuncheon Bus terminal from nami to gapyeong subway station and then to chuncheon subway station OR.. from Nami to Gapyeong intercity bus terminal and then to chuncheon bus terminal ?? 2.are in sOCKHO had only one terminal bus ? 3.Can we buy Bus ticket for go back to seoul for the next day after I arrived in Sockho terminal ? are Bus to Seoul is in the same terminal ? Hi, would like to go to Petit France after visiting Nami Island. Understand there is a bus that can take me there. Will the same bus goes back to the bus stop for me to catch the return shuttle bus to Seoul? Yes, the "Gapyeong Tour Bus" will take you back to Nami Island to catch the return shuttle bus to Seoul. However, it may too rush because the shuttle bus will leave Nami Island at 4pm. If you are late after Petit France, you may take "Gapyeong Tour Bus" to Gappyeong Station and take the train back to Seoul. For more information, you can refer to my reply to "Sharon Kwek" comment above. Hi. Im just confused at the last portion of the train ride. Do we transfer to the GyeongChung (kyeongchung) itx line at Sangbong or at Mangu station? Thanks in advance for the answer. Hi, i would like to visit Nami Island-Petit France-The Garden Of Morning Calm for a day. At first, I planned to visit this 3 places starting from myeongdong. As i dont want to be rushing for the last train/bus after all that trip, i think better for me to stay a night at Gapyeong. Is there any hotel/homestay nearest Gapyeong Station? I'hv google many info about the convenience way to visit this place. As i want to see The garden of morning calm night view, if i stay at gapyeong area, is there any problem for me to get a transport return to hotel at night? Hi, is it possible to alight at Sangbong station and from there get to nami island? Will it take longer? Hello Tom, Sangbong is also possible to alight at to go to Nami Island. Not much difference in my opinion. Hi, I am going to Alpensia Ski Resort in Dec, with a 7 yr old kid and big luggage. Is it advisable to go to Nami from the resort or to return to Seoul than travel to Nami again? If possible to go to Nami from Alpensia, which way of transportation is most recommended? Possible to stay overnight nearby Nami if I want to visit the garden of Morning Calm at night too? Thank you! If you are visiting Seoul, personally I would return to Seoul and then go to Nami again. You can go from Alpensia Ski Resort to Nami Island by using "Alpensia-->Hoenggye terminal(횡계 터미널)-->chuncheon terminal(춘천 터미널)-->Nami island". However, Alpensia do not have bus service to terminal. So you need to take a taxi, the cost will about 10,000KRW. Furthermore, there is only one bus at 10am from Heonggye terminal. That is why it is not recommended to go from Alpensia to Nami using this route. Near Morning Calm are homestay and holiday home. However, you can still catch train and go back to Seoul after visit Morning Calm if you leave earlier. Thank you for your helpful advise! Hi Chicken Share, I read all your comment and all are so helpful. May I know when is the last call for me to leave Morning calm by public transportation (by bus or by train) if I want to go back to Seoul in the same day? Thanks in advance. Is it possible to do so? Or is it more expensive and consume more time? I hope to hear from you soon. I will stay nearby Chungmuro St.
Hello Opec Rahman, it is possible too and not much difference considering the whole journey is quite long. Enjoy y our trip to Nami. As far as I know there is no direct bus from Incheon Airport to CheongPyeong. However, there is direct Chuncheon bus from Gimpo Airport to Cheongpyeong Cross-Country Bus Terminal. If you want, you can go to Gimpo Airport first before taking the bus. Taxi should take about 20 minutes to go to Hoenggye Terminal. Try to go earlier if you want to take the bus there. Hi, I have book the hotel in Nami. I need to know is there a way to book the two-way ticket for shuttle bus to Nami Island with the return trip is on another day since I am staying at the Nami hotel for 2 days? Hi, May I know if there is shuttle bus from Nami or ChunCheon to Alpensia Resort? If yes, what's the schedule and transport duration? I am now considering going from Seoul to Nami Island (check-in to Nami or Chuncheon hotel that night), then to Alpensia, then Gimpo Airport to Jeju, or the reverse route. Is there shuttle bus/train from Chuncheon/Nami to Gimpo Airport directly? Hi Lady Pisces, I do not know of shuttle bus from Nami to Alpensia. Personally I would go to Nami Island on a day trip and return to Seoul. You can take bus from Chuncheon to go to Gimpo Airport. Hi, 6 of us(me, husband, 2 sister-in-law & 2 teenagers) will be travelling to seoul on march 2016 and arrival time is 3:25pm. Starting from Inc Airport, it will take 1hr time to reach city which the time we arrived city already 4:45. Any suggestion of where the first place we should stop and take a rest before going to Nami Island on the next day, or wil we be able to go direct from incheon to nami island on the same day? Thank you. 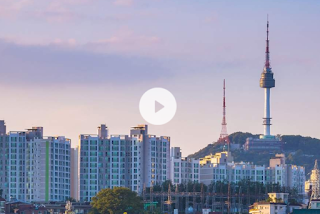 If you are staying in Seoul, you may consider staying at Myeongdong as there are a lot of see, eat and shop in the evening and then go to nami on a day tour the next day. You can go direct from Incheon to Nami Island but it will be late when you arrive and nothing much at night. Hello, I am not sure if there is any 1 day package to both Nami Island and Mount Sorak but they may be separate 1 day packages for these two destinations. You can check either trazy . com or cosmojin . com to see if any package suit you. Do not be shy to contact them directly if you have special requests as you have 10 people group. 1) how we want to get there? 2) this 3 place, is it worth for visit during that time? 3) will we be ae to see beautiful lighting at garden of morning calm during that time? 4) will we be able to catch thw last train/bus after visit all tht places? Hi, we will be staying at Starria Hotel. How can we go to the Hotel once we arrive Seoul Station? Hello fifi, from Seoul Station, you can take subway train LINE 4 to Myeongdong Station. At Myeongdong Station, get out to the ground using EXIT 3 and walk into the alley toward Starria Hostel. Alternatively, you can also take bus 6015 from Incheon airport and get off at Myeongdong Station. Once get off at myeondong station, do we need to take a taxi to reach starria hotel? Or can walk? 3) will we be able to see beautiful lighting at garden of morning calm during that time? 4) will we be able to catch the last train/bus after visit all that places? Hello fifi, first get to Nami Island as described in this post above. After you have visited Nami Island, you can take the Shuttle Bus for Gapyeong Tourist Resorts to go from Nami Island to Petite France. After Petite France, you can take the same bus to Morning Calm Arboretum. The shuttle bus ticket is only 5000won for unlimited use on the same day. These 3 places are very good to visit throughout whole year as they have distinct beautiful scenes during different seasons. However, visiting these 3 places in 1 day is very rush and you may not have time see each of them properly. Based on information, the last shuttle bus from Morning Calm Arboretum to Gapyeong Station is about 5:00pm. If you miss this shuttle bus to Gapyeong Station, you can still take the 7.30pm shuttle bus to Cheongpyeong Station to take train to return to Seoul. What time is the first train from Myeongdong Station to Gapyeong Station? The earliest you can depart from Myeongdong Station to go to Gapyeong Station is about 5:37am in the morning. hello, thanks for sharing about this useful info. I'm still confused about the "Gapyeong Tour Bus" service, can we buy our tickets on the spot? You can buy the bus ticket for Gapyeong Tour Bus on the spot from the bus driver. Keep the ticket because it is valid for one day unlimited use. I just accidentally found your posts when searching for transportation in Seoul, but these information are very helpful! Just a small question, I would like to visit SBS Mokdong since I am a fan of Running man. Could you tell me the way from Myeongdong Station to SBS building? Thank you!! It is actually quite far (40 minutes by subway train) from Myeongdong. From Myeongdong Station, you have to take subway to Dongdaemun History and Cultural Park Station and then change line to Line 5 to take subway to Omokgyo Station and then walk about 500 meters to SBS Mokdong. I've been reading all the article and it's very useful. I read all the questions and answers too and I'm not sure about if there is like a local bus and also the tour bus? If it's how much costs the local bus? If there's no local bus I'm wondering maybe better go with my couple by taxi, as more convenient than the bus for the time of the bus. Taxi 4000 won, 8000 won two ways, same as two tickets of the tour bus. Thank you for helping travellers as us. Just to share: we travel around seoul city mostly use ktx and walk by foot for that 9 days. 1250 every 10km. Over than that will charge 100 every extra 5km. Local bus..mmm..not sure about it. As we stay longer at seoul, so we cant use taxi to save budget. Is it also the same / correct? Not the same route but it is also correct and will bring you to Gapyeong. Enjoy Nami Island! Thanks for the reply. I am thinking to add one more location: Gangchon Rail Bike. How should i arrange my route for this 3 places: Nami Island, Petti France, Gangchon Rail Bike? The shuttle bus will continually stop at all these places a few times per day? Do I need to book ticket in advance for the railbike? Yes, that's right. You can check the timetable of Gapyeong City Tour Shuttle Bus at the bus stops. You can buy the rail park ticket at the ticket booth upon arrival. (just noticed that you mentioned Gang Chon Rail Bike in your question. It is not located in Gapyeong. I hope you meant Gapyeong Rail Bike). Hi Chicken Share, yes, I mean Gapyeong Railbike, I wrongly thought that there is only one railbike in Seoul. May I know after we come down from Gapyeong Station, where could we get the shuttle bus to go to Gapyeong Railbike? Thanks a lot Chicken Share for the information. I would need to be there earlier to catch the bus as earliest as possible. Hi! I would like to do the Nami Island - Petite France - The Garden of Morning Calm Route. I understand that if I finished Morning Calm by 7:00pm, I can still take 7:30pm (last bus) shuttle bus to Cheongpyeong. Am I right? Can somebody answer me? From there I can take the train from Cheongpyeong to Seoul Station. I am getting worried. Anyone know the answer above? You are right. The bus timetable is also displayed at most bus stops. You can double check. Also, be there a bit earlier just to be safe if you are catching the last bus. Thank you very much Chicken Share for your prompt reply. I appreciated your effort. I plan to be at Myeongdong Station before 7:00am on that day and hopefully arrived at Gapyeong Terminal before 9:00am to catch the first bus to Nami. I would like to spend 2 to 3 hours in Nami and after lunch take the 1:15pm bus to Petit France. Spend an hour there and then leave for The Garden of Morning Calm. Since I like to take some night pictures with glittering LED lights in the Garden of Morning Calm, I have no other choice but to stay until 6:00pm. Right after the picture taking, my mission in the Garden of Morning Calm should be over and I would like to take the 6:30pm bus home to Myeongdong. Should I miss the bus, I still have the 7:30pm bus to take me to at least Cheongpyeong Terminal and then to my designated location. Hopefully, things would turn out right. Wow, you plan very well! Enjoy your trip to Nami Island. Trust you will love it! Has been to garden of morning calm on 03/03/16: We use last bus from garden of morning calm to cheongpyeong st. at 8pm. I was just thinking, is there a possibility that the 5,000 won shuttle bus ticket is sold out by the time I will take the bus from Gapyeong Station to Nami Island? Or is there a possibility that seats are all taken by the time I will take the bus? What happens in this scenario? Can you enlighten me? Just to share, the gapyeonng tour bus ticket cost 6,000 per person. Has been there latest 03/03/16. Thanks to Chicken Share for the infor. Eventhough my trip to gapyeong not going well as plan,but the info that i get from ur blog really useful. Thank you. You are most welcome. Hope you bring back some sweet and beautiful memories from here. Yea..in that cold wheather, we manange to walk around seoul and visit some places by our own. Your info do help me alot when we discuss on how to go to gapyeong and everland. Fall in love with seoul scenery, surrounding and people, even most of them really can't speak english. For free traveller like us, your blog really help us much. Keep it up. Plan to visit Korea again with my daughter. For others traveller, enjoy your trip to Korea. wat is the last train back to seoul? hi want to ask how to get back to seoul from Cheongpyeong Terminal? by train or bus?? and wat is the cost? the last train or bus? hi, may i know can i use the subway day pass to go to Nami Island? From Myeongdong to Gapyeong? May I know how much the cost of zipwire to Nami Island? Normally, you can see green and yellowish leaves in early October at Nami Island and Seoraksan. If you want to see fiery red leaves type of autumn foliage, then end of October to early of November is more recommended. 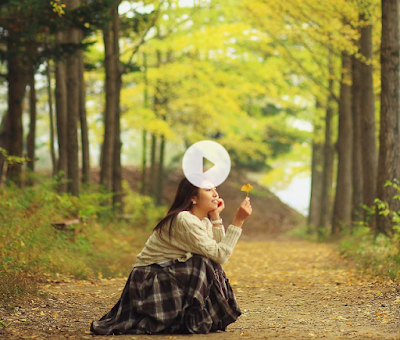 Happy planning your trip to the beautiful Nami Island. Hi :) I want to go to Nami Island and Petite France. Can we book the shuttle bus and go to Nami Island then leave earlier to go to Petite France and then head back to Nami Island to get the shuttle bus back? If you miss you return shuttle bus from Nami Island to Seoul, don't worry, you can still take the train. Hello, i wanted to go to nami island at the end of this year as part of my vacation acitivies in korea, i'm aware that after arriving at gapyeong station, we could just use taxi to get to the ferry terminal, but i wonder & curious will there be a taxi available at the ferry terminal for us to get back to gapyeong station after visiting nami island? if no, how could we get one, should we ask the ticketing counter? Hi, for the bus ride from insadong, can I purchase a one way as I want to hv flexibility to go back by train. Yes, you can purchase a one way ticket for bus from Insadong to Nami Island. Just follow the reverse of train route to get back from Gapyeong Station to Myeongdong Station. I will be there on end of Sept. My stay is in Myeongdong so may i know if i take bus to Nami Island and Petite france, how long it would takes ya? Bus will more easier right? I've read all the comment but i still confusing. Can you guide me? Thank you. Am planning to go Namiseom Island on 2nd day. How do you think it's the best way to approach this from my Hotel (Polo Tourist Hotel at Namdong-gu, Incheon)? Bus will more easier, right? But i afraid the time to take the shuttle bus at 9.30am as my hotel is far away from Seoul. Hope to hearing from you soon. May be you can consider to go to Incheon Airport to take the Chuncheon at 1st Floor, Bus Stop 9C. There is a bus every hour (e.g. 9.10am, 10.10am, 11.10am...). Get off the bus at Gapyeong to go to Nami Island. i am planning to go mt sorak on 2nd Jan 2017, and jeju island the next day, what is the best affordable way to travel from mt sorak to jeju ? From Mt Sorak to Jeju, you can take a bus at Sokcho Intercity Bus Terminal to go to Incheon Airport or Gimp Airport and then take a flight to Jeju Island. Could I just take a taxi to the wharf or just take it straight to Nami? Yes, you can take taxi if you don't want to wait for the bus. It is just a short trip so the taxi fare is not expensive. How many hours does it take for the shuttle bus to arrive at Nami Island? Thank you...I was looking for this exact route since I booked a hotel at Myeongdong. Btw, how many hours do we need to spend for this trip? Will it take a whole day? Will visit Seoul in mid May. To have sufficient time to enjoy and see Nami Island, most people will will go in the morning around 8 to 9am and come back in the later afternoon around 3 to 4pm. That way, you will have an evening free for shopping at Myeongdong or other activities. 1. for a bus ride, due amount of transportation for 2 way with free "entry visa" is 23,000 KRW, right? is the free "entry visa" also refers to the entrance fee? 2. which is cheaper taking a bus or train? thank you in advance for the time in reading and answering my queries! Your blog is really helpfull!! Lost of track of the comments sections too. lol. Me and my friends will visit Seoul in this June'17.. I don't know if this questions been asked before or not.. If we planing to go back to myeongdong station from gapyeong station, is the route works for vice versa? And what is the latest hours for this subway? Hi, your blog is very helpful. :If you want to squeeze Nami Island, Petite France, The Garden of Morning Calm and Gapyeong Rail Bike all in one day, the most effecient way is to join a shuttle bus day tour from EXIT 2 Myeongdong Station (KRW75000 - all 4 admission tickets included). The all inclusive fare (Bus round trip and all tickets) for Nami Island, Petite France, The Garden of Morning Calm and Gapyeong Rail Bike is KRW100,000. Apologies for the wrong information. The KRW75,000 package is for Nami Island, Petite France and The Garden of Morning Calm (No Gapyeong Rail Bike). Hope this answer your questions. Enjoy your trip to the romantic Nami Island. hello... i plan to visit nami island in the morning then visit mt. Seorak in one day trip. Is it possible to have one day trip start from Dongdaemun -- nami island --- mt. seorak --- back to dongdaemun? And how to get there? 1) the subway ticket fee from myeongdong to gapyeong you mentioned is one way? If you stay Hostel Tommy at Jongno, it is nearer to take the Insadong course of the tour bus to Nami Island. However, if you take bus, you cannot leave earlier back to Myeongdong. You have to follow the bus time because bus fare include return trip (unless you want to forego your return bus trip, in that case you can take train back). hi, I am Jeissies, who wish to visit korea next year, may I know is it possible if i take shuttle bus to Nami island from Myeongdong then buy the Gapyeong city tour bus ticket at Nami Island in order to visit Petite France and Garden of the Morning Calm? Thanks. You can take this tour bus instead https://goo.gl/M1VAjZ . It is more convenient and cost effective if you want to visit Nami Island from MYeongdong, and then visit Petite France and Garden of Morning Calm. It will bring you home to Myeongdong too. Hi! Thank you for all the help. It made my planning of our vacation in South Korea much easier. I am planning to go also to Jade Garden after Nami Island. It is possible if I am going to take the roundtrip bus from Myeongdong to Nami Island. I am thinking about the time we are about to spend on both attractions and the travel time from Nami Island and Jade Garden. Given that we have to be at the bus stop at 4 pm for the shuttle bus. Hi! I want the TIP 1 but does it only have 1 bus trip per day? Hi, I would like to know more about the day tour bus package from Myndeong Exit 2, what is the name of the bus company and how do I reserve the seat? 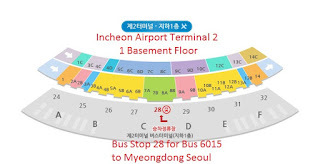 Which Bus to Take from Incheon to Myeongdong So exactly which bus do you need to take to go to Myeongdong once you arrive at Incheon International Airport? Answer: BUS 6015. You can catch bus 6015 at eitherTERMINAL 1PLATFORM 5B-1 of outside the arrival hall (1st Floor) of Incheon Airport orthe new TERMINAL 2 (T2) 1 basement floor PLATFORM NUMBER 28. The location of bus 6015 bus stops at Terminal 1 and Terminal 2 are shown below. A bit of climbing, a bit of walking but they are all worth it when you arrive at Namsan Park from the nearest subway station, Myeongdong. Enjoying the panoramic view of Seoul from N Seoul Tower completes your visit to Seoul. Here is how to get to the top of N Seoul Tower, the highest point in Seoul. Assuming that you take subway train to Myeongdong, or better, staying in Myeongdong, lets start the journey to the top from Myeongdong Subway Station on LINE 4 of Seoul Metropolitan Subway network. Just choose one of the three options below to get to the N-Seoul Tower.